One of the major difference between the short circuit and the overload is that the short circuit occurs because of the fault between the lines or line-to-earth whereas the overload means the equipment draw the excess of current from the supply. The other differences between them are explained below in the comparison chart. The term overloaded is referred to the circuit or devices. The circuit is said to have overloaded when more than the desirable load is applied to the circuit. The overload occurs because of the malfunctioning of the equipment or faulty circuits. Whereas the short-circuit condition occurs when the metal wires come in contact with each other or because of insulation failures. The resistance of the devices during the short circuit becomes zero due to which the heavy current flow through the network. Meaning In the short-circuit the voltage at the fault point decreases to zero and current of irregular high value flow through the faulty point of the network. The overload means that load greater than the desired value have been imposed on the system. Voltage	 Zero The voltage becomes low, but cannot be zero. Current High	 Low as compared to short circuit. Occur It occurs when the neutral and live wire touch each other. It occurs when a large number of devices are joint in a single socket. The circuit that allows the electric current to pass through the random path which has low resistance is known as the short circuit. 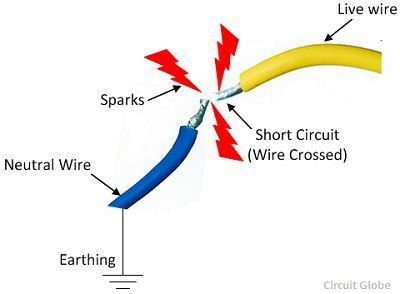 The short circuit causes the heavy current which damages the insulation of the electrical equipment. It mainly occurs when the two wire touches each other or when the insulation between the conductor breaks down. The short circuit causes a heavy current in the power system which produces excessive heat and hence results in fire or explosion. The short-circuit produces the arc that causes the major damage to the element of the power system. The short circuit affects the stability of the network which disturbs the continuity of the supply. The overload means more than the desires load imposed on the power system network. The voltage at the overloads become diminished to a very low value, but it cannot be zero. The current in the overloaded condition is high but considerably lower than the short circuit current. The overloaded increase the temperature regarding joules, which causes burns and hence damage the electrical equipment. The overloaded condition damage the equipment of the power system. 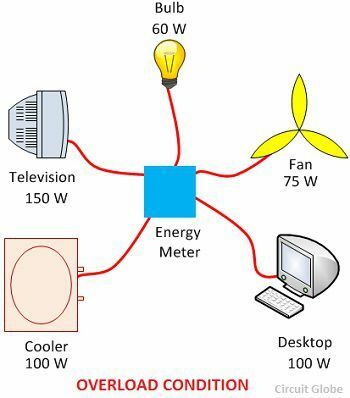 For example – Consider the inverter has a rating of 400 watts, and if the load of 800 watts is connected across it, then this will cause an overload. The short circuit means the voltage at the fault points reduces to zero and the large current starts flowing through the circuit whereas in the overloaded condition the load greater than the suitable value are applied to the system. The voltage at the short circuit decreases to zero, whereas in the overloaded condition the voltages reduce, but it cannot be zero. During the short circuit, the resistance of the path of current becomes low due to which the heavy current flow through the circuit whereas in overload condition the magnitude of the current is high but appreciably low as compared to short circuit current. The short circuit occurs in the system when the neutral and the live wire comes in contact with each other, whereas overload occurs when the number of electrical equipment connects to the same socket. The short circuit power is mainly fed through the synchronous generator, synchronous motor and synchronous condensers.